The new Pakistan ETF launch coincided with Chinese President Xi Jinping's visit to Pakistan where he announced massive $46 billion investment in Pakistan's energy and infrastructure. The sectors expected to benefit most initially from the Chinese investment are: energy, cement and financial services. Although the ETF launch timing was fortuitous, it was actually planned well before the Chinese leader's visit. It caters to individual investors seeking outsize returns in Karachi where KSE-100 index has been outperforming both emerging and frontier markets for several years. In 2014, the KSE-100 Index gained 6,870 points thereby generating a handsome return of 27% (31% return in US$ terms), making Pakistan's KSE world's third best performing market. Total offerings in the year 2014 reached 9 as compared to 3 in the year 2013. After a gap of seven years, Rs 73 billion were raised through offerings in 2014 as compared to a meager Rs 4 billion raised in 2013. Foreign investors, that hold US$ 6.1 billion worth of Pakistani shares -which is 33% of the free-float (9% of market capitalization)-remained net buyers in 2014. The ETF fact sheet shows that the index has 31 holdings in it. Also, the industry weightings are concentrated in financials (32.7%), energy (24.2%), materials (23%) and utilities (10.8%) — roughly 90% in four sectors alone. Even after outperforming both emerging and frontier market indices, Pakistani shares can be bought at deep discounts which make them very attractive, according to Renaissance Capital’s chief economist Charles Robertson. MSCI (Morgan Stanley Composite Index) Pakistan trades at only 8.4 times forward earnings, a 17% discount to MSCI Frontier Markets. For comparison purposes, fellow frontier south Asia markets Sri Lanka and Bangladesh trade at 13.4x and 21.4x respectively. India, included in the emerging market index, trades at 16.8 times. Chinese investment in energy and infrastructure will help stimulate all sectors of Pakistani economy. But the sectors benefiting most from the $46 billion investment will likely include banks, energy and building materials, the sectors which are the favorites of Pakistani billionaire investor Mian Mohammad Mansha. Being close to the ruling Sharif family makes Mansha the ultimate insider. Beyond his investments in banking, cement, energy and textiles, Mansha is also starting to invest in consumer products sector benefiting from rising incomes, growing middle class and increasing jobs created in Pakistan by the massive Chinese investment. Mansha owns a big chunk of Muslim Commercial Bank (MCB) shares. He has recently been pumping more money into energy, cement and dairy businesses. Mansha's DG Khan Cements has announced plans to build a $300 million cement plant near Karachi. In additions, his Nishat Dairies has imported thousands of dairy cows for a dairy farm in Lahore. The $46 billion Chinese investment in energy and infrastructure has brought attention to tremendous investment opportunities in Pakistan, a nation of nearly 200 million people with rising middle class and growing consumption. 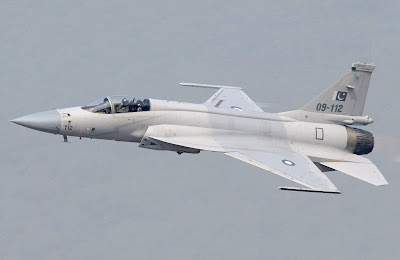 Pakistani military's recent successes against the terrorists and China's massive investment commitments are expected to boost investor confidence in the country. Higher confidence will help draw other significant investors to invest in Pakistan over the next several years. Full Disclosure: I have personally invested in PAK ETF. In his first state visit to Pakistan last week, China’s President Xi Jinping pledged $46 billion to build a 3,000-kilometer (1,860-mile) economic corridor linking China’s restive west to Pakistan’s southwest port on the Arabian Sea. It is by far Beijing’s biggest bet on another developing country. Earlier this month, Pakistan raised $1 billion from the sale of a big stake in its largest commercial bank, Habib Bank (ticker: HBL.Pakistan). Demand was overwhelming, and three-quarters of the shares went to foreigners, mostly long-term institutional investors. We associate Pakistan with terrorism and sectarian violence. But China’s leaders are practical and business-minded: Are we missing something? In many ways, Pakistan’s prospects look brighter today than they have in a long time; in fact they’re similar to those of its bitter rival, India. Growth has ticked up, from 3.7% in 2013 to 4.1% last year. Like India, Pakistan recently got nods of approval from the International Monetary Fund and Moody’s, with the former lifting its GDP forecast to 4.3% this year and 4.7% next, and the latter raising Pakistan’s credit outlook to positive from stable. Pakistan almost halved its budget deficit to 4.7% of GDP last year, and is now targeting 4%. Lower oil prices also help Pakistan. Inflation hit a new low of 2.5% in March, down from 8.5% a year earlier. In March, Pakistan’s central bank cut its key interest rate to 8%, with another reduction possible. The major concern is, of course, security. While falling, the number of civilian fatalities from terrorist attacks still totaled 1,781 last year. That was a seven-year low. So far this year, there are 352 fatalities. INVESTORS WILL USUALLY PAY a premium for structural reform. On this count, “Pakistan ticks many of the boxes” but is not getting the love, says Renaissance Capital’s chief economist, Charles Robertson. It trades at only 8.4 times forward earnings, whereas investors’ darling India fetches 16.8 times. Much of the shortfall is Pakistan’s fault. During the financial crisis in 2008, Pakistan suspended stock trading, only to see a sharp selloff upon re-opening. The episode prompted indexer MSCI to downgrade the country from emerging to frontier market. If operating normally, the Karachi Stock Exchange, with a market valuation above $70 billion, and $140 million in daily trading volume, would qualify as an emerging market. Over 25 stocks generate more than $1 million in daily trades. Stocks have done very well since the shutdown. They’ve risen an annualized 26% over five years. Last week, Global X launched the first U.S.-listed Pakistani exchange-traded fund, Global X MSCI Pakistan, under the ticker PAK. Pakistani cement makers, beneficiaries of infrastructure spending, are a good bet, says Asha Mehta, frontier markets portfolio manager at Acadian Asset Management. Pioneer Cement (PIOC.Pakistan), for example, expanded its operating margin from 27% in 2012 to 34% in 2014 and trades at only 7.7 times earnings. Pakistan isn’t for the faint-hearted. In March, its market fell 10% in five days because of one investor: Miami-based Everest Capital unloaded around $70 million to cover a bad bet on the Swiss franc, and local sell orders ballooned from resulting margin calls and panic. Though Pakistan’s stock market recovered, it’s unlikely that such an event could occur in India’s bigger, more mature market. THOSE in search of a thriving stockmarket, a stable currency and low inflation would not normally pitch up in Pakistan. It is more readily thought of as a pit of instability than as a source of opportunity. Yet Pakistan is enjoying a rare period of optimism about its economy. The IMF reckons that the economy will grow by 4.7% next year, the fastest rate in eight years. Consumer prices rose by 2.5% in the year to March, the smallest increase for more than a decade. Twice already this year the central bank has lowered its benchmark interest rate. Some indicators are pointing to an upturn in spending. Compared with a year earlier, cement sales, which are a guide to how much construction is taking place, rose by 5.5% from July to March. Car sales rose by 22% over the same period. A fall of two-fifths in the oil price is a huge slice of luck for a country such as Pakistan. It relies on imported fuel oil for two-fifths of its power supply and is prone to periodic balance-of-payments crises (see chart). The country’s import bill can easily overwhelm the foreign-exchange earnings from textile exports and the remittances that Pakistanis working in the Middle East and Europe send home. In 2013-14 Pakistan’s net import bill for oil came to $12.6 billion, or around 5% of GDP. But if oil prices stay low, Pakistan could save a total of $12 billion in the next three years, says the IMF. The money could be spent on things with more local content and give the economy a lift. The government of Nawaz Sharif takes some credit for the economy’s new stability. It has stuck to an IMF programme agreed to in 2013, a few months after it came to power in Pakistan’s first-ever handover from one civilian government to another. Foreign-exchange reserves have more than doubled, to $17.7 billion. Electricity tariffs have been raised, and some unpaid bills collected, easing the cash burden on hard-pressed distribution companies. Tax receipts have risen, albeit from pitiful levels, in response to efforts to broaden the base and cut exemptions. The revenue agency has sent over 150,000 tax notices to non-payers. More retailers are being drawn into the indirect-tax net. A draft budget aims to bring the budget deficit below 4% of GDP in 2015-16, from a peak of over 8%. A privatisation drive that stalled last June resumed in April, when the government sold its stake in Habib Bank, the country’s largest lender, for $1 billion. Three-quarters of bids came from foreign investors. Pakistan’s stockmarket has doubled in dollar terms since the start of 2012, thanks in large part to such foreign interest. Privatisations will only add to the market’s variety and appeal. Listed companies are highly profitable, although in part because they often face too little competition. Visitors to Pakistan are surprised to discover good roads and a strong business culture. The country is mid-table in the World Bank’s ease-of-doing-business rankings, well above India. The infrastructure is solid enough to support big fast-food chains: McDonald’s, KFC, Pizza Hut and Subway have 187 outlets between them, more than in all of Sub-Saharan Africa’s “frontier” economies combined, says Daniel Salter, of Renaissance Capital, a stockbrokers. The progress in providing economic stability is encouraging. But Pakistan needs sustained growth of 5-7% a year if it is markedly to cut poverty—at the last count, nearly a quarter of Pakistanis were below the poverty line. There are doubts to whether Mr Sharif has the strength and authority to implement deeper reforms. Despite a better electricity industry, power shortages remain a bugbear. Big firms in textiles, which account for over half of Pakistan’s exports, have long taken to generating their own electricity. Standard & Poor’s raised Pakistan’s credit rating outlook to positive from stable, as lower energy costs and an IMF loan boost growth and improve finances. “The positive outlook reflects our expectations of Pakistan’s improved economic growth prospects, fiscal and external performance, and the supportive relationship of external donors over the next 12 months,” the company said in a statement on Tuesday. It affirmed its B- rating, which is among the so-called junk grades, and raised the 2015-2017 average growth projection to 4.6 percent from 3.8 percent. Risks include higher oil prices, weakness in key trading partners and violence, S&P said. The move follows a similar step by Moody’s Investors Service in March as Prime Minister Nawaz Sharif looks to resolve Pakistan’s crippling power shortages and boost investment. The nation’s foreign exchange reserves have almost doubled to $12.6 billion with the help of an International Monetary Fund loan and its stocks are among Asia’s best performers this quarter. “Foreign inflows can be expected in the country and more dollars would mean more economic stability,” Saad Khan, an economist at Arif Habib Ltd. said by phone from Karachi after the upgrade. The benchmark KSE100 index has risen 10.7 percent this quarter, trailing only Chinese and Hong Kong equities, according to data compiled by Bloomberg. The gauge fell 0.8 percent as of 12:24 p.m. in Karachi on Tuesday and Pakistan’s rupee was little changed. China pledged $45 billion for roads, ports and power plants when President Xi Jinping visited Pakistan last month. The planned investment, 28 times more than the foreign direct investment Pakistan received in year ended June, will spur investment activity and help ease the country’s growing energy shortage, Moody’s said in a report on Monday. Pakistan took a $6.6 billion loan from the IMF in 2013 to avert a balance-of-payments crisis and has cleared six program reviews. Oil prices have fallen 38 percent over the past year, lowering Pakistan’s import bill, easing price pressures and giving the central bank room to cut interest rates. S&P forecasts Pakistan will report an average budget deficit of 3.5 percent of gross domestic product during 2016-2019 with interest costs falling to about 25.5 percent of revenues from an estimated 30.6 percent in 2015. Inflation is expected to average 4.8 percent over 2015-2019. “We are now seeing growing stability in the economy,” he (State Bank of Pakistan Governor Wathra) says in an interview with the Financial Times. The IMF has acknowledged that Pakistan averted a balance of payments crisis in 2013 and managed to stabilise its foreign reserves. This week Standard & Poor’s, the credit rating agency, raised the outlook for its B minus rating from stable to positive, while Moody’s last month raised its outlook to stable from negative — albeit for a Caa1 rating, which puts it one notch above Greece. With liquid foreign reserves having grown almost fourfold in the past year to $12.5bn, a figure equivalent to about three months of imports, Mr Wathra has less cause for concern about the stability of the rupee than some of his predecessors. The recent plunge in the price of crude has seen the cost of oil imports fall to $9.7bn in the nine months to March, down from just over $11.2bn a year earlier, according to central bank figures. Falling oil prices have also helped lower the fiscal deficit to an expected 5 per cent of gross domestic product in the year to June, down from above 8 per cent just over two years ago. And the country’s GDP is forecast to grow by about 4 per cent this year, following a similar rise last year. But the government’s critics say the recent strong economic performance owes more to luck and a falling oil price than design. Other risks remain. Pakistan’s economy is vulnerable to foreign policy — both its own and that of others. Tensions have mounted over the country’s reluctance to provide ground troops, naval assets and fighter jets to Saudi Arabia to join its offensive inYemen. Some even fear that up to 2m Pakistani expatriate workers in Saudi Arabia could be repatriated — an unlikely but devastating outcome given the billions of dollars of remittances they send home every year. MSCI added Hub Power Company and Indus Motor Company from Pakistan while removing Pakistan Tobacco from its MSCI FM Index in its latest Semi-Annual Index Review for MSCI Equity Indices. However, the news failed to trigger a positive sentiment on the Karachi Stock Exchange (KSE), although the inclusion of two Pakistani companies should ideally bring more foreign portfolio investment and increased volumes to the country’s equity market. In 2014, the Semi-Annual Index Review for MSCI Equity Indices had resulted in the addition of four Pakistani companies (and deletion of one) into the MSCI FM Index. Pakistan gained notably by the last year’s review, which reclassified Qatar and UAE from FM to Emerging Markets (EM). As a result, Pakistan’s weight in MSCI FM Index increased to 8.8% as of April 30, 2015 compared to 4.1% in May 2014. According to Topline Securities, Pakistan’s weight in MSCI FM Index is expected to increase after these additions/deletion and a successful secondary offering in Habib Bank. It added that Pakistan will have as many as 16 companies – namely Engro Corporation, Fatima Fertilizers, Fauji Fertilizers, Habib Bank, Hubco, Indus Motor, K-Electric, Lucky Cement, MCB Bank, National Bank, OGDC, Pakistan Oilfields, Pakistan Petroleum, PSO, PTCL and United Bank – in the MSCI FM Index following the review. Another investment decision support tool, MSCI FM Small Cap Index, added four Pakistani companies – Kohat Cement, Maple Leaf Cement, Pak Elektron and Pak Suzuki – in the latest Semi-Annual Index Review for MSCI Equity Indices. Five Pakistani companies, namely Hubco, Indus Motor, DG Khan Cement, Murree Brewery and National Foods, have been deleted from the MSCI FM Small Cap Index. With the latest round of additions and deletions, Pakistan will have 22 companies in the MSCI Small Cap Index. According to Topline Securities, MSCI is expected to announce the result of its 2015 Annual Market Classification Review on June 9. The beginning of any consultation process to upgrade Pakistan from the MSCI Frontier Markets to the MSCI Emerging Markets may be initiated in the classification review, it said. “The consultation process, however, takes a minimum of six to 12 months before the actual decision is taken to upgrade any country,” it stated. Contrary to the negative headlines we often see in the press, you get an entirely different perspective on Pakistan when visiting the country. Over the last few years, there has been a dramatic change in the political landscape. We have had for the first time a government completing a full term, the first time since independence 67 years ago, while the transfer of power to the opposition was also handed peacefully. Importantly, stability within the political landscape has led to a stability of economics and commitment to adhere to an International Monetary Fund programme. This means we are dealing with a country that is lowering its budget deficit, privatising state-owned assets and starting to tackle energy shortages; all meaningful milestones for international investors. As part of the IMF program, it has committed to a very aggressive, almost unprecedented privatisation program. In June 2014, Pakistan experienced its first privatisation in seven years, with the sale of 19.8% of United Bank. There are also other major plans for 2015. Meanwhile, the country is also embarking and prioritising on a massive restructuring and privatisation of its power sector, which is much needed to unleash Pakistan’s economic growth. After slumping to less than 3% from 2007 to 2011, economic growth is steadily rebounding and is estimated at 5.5% this year, but this could be much higher if structural changes continue. The fall in oil and other commodities is also providing a further tailwind to the economy. This has had a knock-on effect to inflation, with the rate dropping quite sharply in recent months, and is now at an 11-year low. On the back of lower inflationary pressures, Pakistan's central bank cut its key discount rate to 8.5% in January and a further 50 basis points reduction in March to 8%. Encouragingly, we are expecting more to come if inflation remains anchored at these lower levels. Pakistan’s 186 million population is the largest among frontier markets, and the sixth largest globally – after China, India, US, Indonesia and Brazil. A 9% weight in the MSCI Frontier Markets Index ranks Pakistan third by weight, after Kuwait and Nigeria, making it the largest oil-importing country in the index. With 560 companies listed, the $77 billion market cap Karachi Stock Exchange trades $150 million daily, giving Pakistan the most liquid equity market among countries in the MSCI Frontier Markets index. The market’s free-float is approximately 33%, with around 35% of the free-float owned by foreigners. However, along with Sri Lanka, Pakistan stands out among Asian frontier markets as much of the bad news is already embedded in valuations. Recent gains have moved that forward P/E onto 9-times, but this still remains very favourable versus other frontier, emerging and developed markets. The opportunity set in Asia, as with other frontier markets, is majorly focused on the financials sector. There are many banks trading at high single-digit to low double-digit levels when considering forward looking price-to-earnings ratios. Many frontier banks are also generating exciting, but also sustainable, return on equity levels. Twenty per cent per-annum growth is not uncommon, especially in Pakistan and Sri Lanka. In Pakistan, banks had been in a de-leveraging cycle for almost five years up until the summer of 2014. This has reversed sharply and loan growth has now picked up, into double-digits in some cases, as corporates have started to re-leverage. This is now coming through strongly in profits growth. Overall, Pakistan and other markets in the Asian frontier region are becoming more important to investors. Positive demographics and low credit penetration levels provide a robust backdrop for investing. India is considered by some to be the best emerging market for several reasons and the one to buy. The favorable environment for India is passing and the new one contains a great deal of headwinds. India is not a buy in my assessment once you take everything into account. Of all the emerging markets that are out there, India is one of the more prominent ones. It's one of the BRIC countries, together with Brazil, Russia and China. India easily ranks as one of the more popular investment destinations among emerging markets. In fact, there are a large number of people who consider India as their number one pick when it comes to deciding where to invest in emerging markets. There are many reasons why India is currently a favored destination among some investors. India is an economy with relatively fast growth, at least in comparison to most countries out there. It also has a very large and a fairly young population. India has the potential to one day become a leading economy and a large consumer of all sorts of goods and services. Investing early on could pay off handsomely some day. Unlike many other emerging markets, India does not depend on the export of commodities. On the contrary, India is a major importer of commodities such as crude oil and gold. The big drop in commodity prices starting in 2014 has therefore not hurt India, in contrast to other emerging markets that have experienced much turmoil due to the drop in prices of commodities. The year 2014 also saw the election of the Modi government, which is considered by many to be friendly to businesses and open to reform. This factor along with others combined to generate a lot of optimism about the future and India became one of the best performing markets in 2014 as investment capital poured into the country. However, in a couple of days it will be exactly one year since the new government in India was elected. India will at some point have to turn some of its election promises into action. It cannot rely on being given the benefit of the doubt because its honeymoon period is now pretty much over. The government will be judged on what it's able to accomplish and not just what it says it's going to do. Unfortunately, some of the early signs are not very promising. For instance, foreign companies and investors are still in the dark concerning potential tax payments that no one was informed of but will still be held liable for. The Indian government has not done enough to resolve this and other outstanding issues. Frankly, the Indian government has little if anything to show for with its one year anniversary coming up. Furthermore, the price of crude oil has stopped declining. If it continues to rebound, other commodities could follow suit because the price of oil plays an important role when it comes to extracting commodities from the ground. This is a significant development for India because crude oil accounts for about one third of its import bill. The declining price of crude oil was thought by many to be the reason for optimism because it would allow India to turn its current account deficit into a surplus. This has yet to happen and the rising price of crude oil makes that possibility more and more unlikely. The deficit could actually increase instead of decline as some had forecast. It's important to remember that India has a number of weak fundamentals. India has a problem with chronic deficits, including a current account deficit, a trade deficit and a budget deficit. The deficits force India into borrowing, which is not a good situation to be in at this moment. Interest rates are looking to go up, which means that India will have to pay more for its borrowing. You do not want to pay more if you're already short on cash. The (Pakistan) government accepted on Monday it had missed economic growth target for this fiscal year because of the underperformance of agriculture and industrial sectors. The economy grew at the rate of 4.24 per cent as against the projected target of 5.1pc for 2014-15. Last year the target was 4.4pc, but the growth rate was 4.03pc. The matter was discussed in the meeting of the National Accounts Committee (NAC) held on Monday. Out of 20 key growth indicators, the NAC documents showed only 10 were on target. In March 2015, the Asian Development Bank Outlook projected moderate growth in Pakistan at 4.2pc in FY15 and 4.5pc for FY16. The ADB attributed the low growth to slow pace of reforms in energy, taxation and public sector enterprises. The NAC cited minor crops, livestock, fishery, small-scale manufacturing, slaughtering, construction, general government services, finance and insurance as key drivers of growth in 2014-15. The growth rate, however, is provisional as final numbers for full year will firm up later. The agriculture sector posted growth of 2.88pc against 3.3pc target in 2014-15. Last year the sector grew by 2.69pc. Major crops recorded a paltry growth of 0.28pc against the target of 1.5pc. The worrisome factor is that yield of some crops posted negative growth. The wheat production was projected at 25.478 million tonnes for this year as against 25.979 million tonnes last year, a decline of 1.93pc. The sugarcane yield declined by 7.13pc, maize by 5.04pc during this fiscal over the same period last year. There is fear that low yield of minor crops could lead to higher food inflation. Livestock, the second largest sub-sector of agriculture, posted a growth of 4.12pc against the target of 3.8pc. The fishery sector expanded 5.75pc as against 0.98pc last year. And forestry exhibited a growth of 3.15pc against a negative growth of 6.74pc last year. The industrial sector posted a growth of 3.62pc against the target of 6.8pc in 2014-15. Last year it grew by 4.45pc. Of these the mining and quarrying sector recorded a growth of 3.84pc against the target of 6.5pc. The manufacturing recorded a growth of 3.17pc down from 4.46pc last year. The projected target was 6.9pc. The LSM posted a growth of 2.38pc against the target of 7pc, small-scale manufacturing 8.24pc against the target of 8.4pc and slaughtering 3.32pc against the target of 3.6pc. The growth in construction sector was 7.05pc compared to 7.25pc last year. And supply of electricity, and gas also depicted a growth of 5pc against a negative growth of 26.38pc last year. The services sector grew at 4.95pc in 2014-15. Last year it grew by 4.37pc. The major contributors were the general government services, which grew by 9.44pc, finance and insurance 6.18pc, housing services 4pc, transport 4.21pc and wholesale and retail trade 3.38pc this fiscal year over the last year. Pakistan Prime Minister Nawaz Sharif’s push to build power plants, roads and rail links is prompting a local steelmaker to expand by selling shares in the nation’s biggest initial public offering in eight years. Amreli Steels Ltd., the South Asian country’s biggest maker of steel bars used in construction, plans to raise as much as 4 billion rupees ($39 million) next month from the sale of 70 million new shares. The proceeds will help more than double its capacity to 450,000 tons from 200,000 tons, Amreli’s director Hadi Akberali said in an interview. The steelmaker is betting on a potential boom in demand for the alloy as the $232 billion economy expands at the fastest pace in eight years, fueled by higher remittances and consumer spending. Last month, China signed deals for $28 billion of investments in Pakistan as part of a planned $45 billion economic corridor that includes power plants and dams. Amreli’s share offer also comes amid gains in the benchmark Karachi 100 Index, which, according to data compiled by Bloomberg, is the world’s second-best performer in the past six years. The gauge may rally 52 percent in the next two to three years, Stockholm-based Tundra Fonder AB fund manager Shamoon Tariq predicted in an April interview. The benchmark index fell 0.3 percent to 32,749 as of 11:36 a.m. in Karachi. This year, it has climbed 2 percent. The company will raise between 2 billion rupees and 4 billion rupees, depending on the final price, Akberali said, adding he expects strong demand. AKD Securities Ltd. and Bank Alfalah Ltd. will be the advisers on the transaction. A 4 billion-rupee IPO would be the biggest in Pakistan since Habib Bank Ltd. raised 8.1 billion rupees in 2007, according to data compiled by Bloomberg. The number of initial share offerings rose to five in 2014, the most in six years, according to data compiled by Bloomberg. MSCI, a leading provider of international investment decision support tools, said on Wednesday it may reclassify the MSCI Pakistan Index from ‘Frontier Markets’ to ‘Emerging Markets’ next year. “We will add the MSCI Pakistan Index to the review list for its potential reclassification to Emerging Markets as part of the 2016 Annual Market Classification Review,” MSCI said. Global institutional investors use different MSCI indices — such as frontier, emerging, China and US markets – to create balanced portfolios aimed at generating maximum returns while keeping in view their overall risk appetite. The decision may appear to be a routine reclassification of economies by MSCI, but it has the potential to dramatically change dynamics of the Pakistan equity market: MSCI Emerging Market Index is tracked by global funds worth about $1.7 trillion, according to Bloomberg data. “Not only the size of passive fund flows will increase, many large Emerging Markets funds may return to Pakistan,” says Topline Securities investment analyst Muhammad Tahir Saeed about the possibility of the elevation of the MSCI Pakistan Index to Emerging Markets next year. In its brief commentary on the decision, MSCI said most accessibility criteria of the Pakistani equity market meet the MSCI Emerging Markets standards, except for some potential issues with the stability of the institutional framework. “The Pakistani equity market has grown significantly and its liquidity has greatly improved. As a result, concerns about the potential for failing to meet size and liquidity criteria should there be a negative market event have receded,” MSCI noted. Pakistan was part of the MSCI Emerging Markets between 1994 and 2008. However, the temporary closure of the Karachi Stock Exchange in 2008 led MSCI to remove it from the Emerging Markets and classify it as a “standalone country index”. MSCI made Pakistan a part of the Frontier Markets Index in May 2009 and it has remained as such since then. The indexer says the MSCI Pakistan Index may potentially see its number of constituents decrease in the event of its reclassification to the Emerging Markets status. The reason for the reduction in the number of constituents is the application of more stringent ‘investability’ requirements for the MSCI Emerging Markets Index. Pakistan currently has as many as 16 companies in the MSCI Frontier Markets Index, namely Engro Corporation, Fatima Fertilizers, Fauji Fertilizers, Habib Bank, Hubco, Indus Motor, K-Electric, Lucky Cement, MCB Bank, National Bank, OGDC, Pakistan Oilfields, Pakistan Petroleum, PSO, PTCL and United Bank. Based on a simulation using current data, MSCI believes the number of constituents will decrease from 16 to only six in the case of the possible reclassification. The removal of 10 companies from the index will result in a drop of 32% in its market capitalisation. Notwithstanding the immediate drop in the index market capitalisation, the possible reclassification is expected to attract greater foreign inflows to the Pakistani equity market. “Although Pakistan’s weight in the Emerging Markets will be small, (the size of) funds tracking Emerging Markets is many times higher than (that of) funds tracking the Frontier Markets,” Tahir said. Index provider MSCI has revealed it plans to consider upgrading Pakistan from frontier- to emerging-market status next year. Citing “a number of positive developments over the course of the past 12 to 18 months,” MSCI said it would include Pakistan on its 2016 review list. News that Pakistan is being considered for inclusion in the MSCI emerging markets index will be seized upon by a government desperate for international recognition of what it says are its achievements in stabilizing the Pakistani economy. The government of Prime Minister Nawaz Sharif, who came to power in June 2013, inherited low growth, high inflation, a foreign-exchange reserve crisis and crippling electricity shortages. Since then, inflation has dropped sharply and foreign exchange reserves are more comfortable. The government is now on a mission to boost economic growth from the anemic 3% that it inherited to around 7% by the end of its five-year term. The IMF expects GDP growth to hit 4.3% this year and rise to 4.7% in 2016. However, considerable challenges remain. The country is woefully short of electricity, for example, while plans to seriously boost the paltry tax revenues are also yet to come to fruition. Tax revenues currently stand at around 10% of GDP. Pakistan is banking on help from China, which has a $46bn investment plan intended to address the country’s energy deficit and put in place other infrastructure for industrialization that it is hoped will change Pakistan’s economic trajectory. The Karachi stock market has delivered stellar performance in recent years. Since the May 2013 election, it has gained more than 70%. News on the possible inclusion in the emerging markets index—a decision on that will be made by MSCI next year—had little immediate impact on the market on Tuesday. Pakistan was last in the MSCI emerging markets index in 2008 and brokers said its re-inclusion would be positive. “Not only size of passive fund flows will increase, many large [emerging markets] funds may return back to Pakistan,” Karachi brokerage Topline Securities said in a note on Tuesday. Investors piled into Pakistan’s first real-estate investment trust, which was launched this week with a public offer that was heavily over-subscribed, the REIT’s lead manager and analysts said on Thursday. The Dolmen City REIT offered investors a 25% stake in a 22.24 billion rupee ($218.5 million) shopping mall and an office complex at Dolmen City, one of the most prominent real estate developments in Karachi, Pakistan’s largest city and its economic hub. The Arabian Sea-front project includes three other structures not included in the REIT. Traders and the REIT’s main advisor said the initial offer for 75% of the trust to institutional investors and high net-worth individuals through bookbuilding on Monday and Tuesday drew demand of more than 7 billion rupees for an offering of shares worth 4.17 billion rupees at a floor price of 10 Pakistani rupees ($0.10). At the strike price, the initial offer raised 4.59 billion rupees, according to the REIT’s lead manager. The remaining 25% of the stake was to be offered to the public on Friday at a strike price of 11 rupees ($0.11). Analysts and the REIT’s management expected the Friday offering to be fully subscribed as well, raising another 1.53 billion rupees. “The interest rate is at a 42-year low, with the discount rate at 7%, so for people who invest in fixed-income instruments, REITs are attractive,” said Muhammad Tahir Saeed, deputy head of research at Topline Securities, a Karachi-based brokerage. Pakistan’s economy has improved in recent years, despite political turmoil, major security challenges, and chronic electricity shortages that have hobbled industry. The country’s main stock market in Karachi has gained 72% since the 2013 election and the country’s improving prospects are increasingly being recognized internationally. Prime Minister Nawaz Sharif’s government has said boosting investment is one of its key economic objectives. With both buildings in the Dolmen City REIT fully occupied, it is expected to yield 9.5% in the first year, with a 10% increase every year based on escalation clauses in tenancy agreements. The development is located next to two of Karachi’s most affluent residential areas. The Dolmen Mall Clifton, Pakistan’s largest shopping mall, currently has an occupancy rate of over 90%, according to a fact sheet provided by the REIT management. The mall has 130 stores, including foreign outlets such as Debenhams DEB.LN -1.13%, and a multi-level department store. The neighboring Harbour Front office complex is currently fully occupied, with several high-profile tenants like Procter & Gamble and Engro, one of Pakistan’s largest corporations. Pakistan’s commercial property sector was described in a first-quarter report this year by Lamudi Pakistan, an online real estate portal, as “almost at a standstill”. But analysts said investors in Pakistan are still keen on real estate as a long-term asset, particularly in properties such as Dolmen City’s Harbour Front with high-profile corporate tenants. “In the long term there are significant opportunities as prices are low, meaning potential yields are high, and there is considerable room to expand and modernize Pakistan’s stock of commercial real estate,” BMI Research said in a report on the country’s real estate sector earlier this year. Analysts said the success of the Dolmen City REIT could boost interest in the instrument. Pakistan had a good week. Index provider MSCI surprised many observers by announcing that the South Asian nation will be included in MSCI’s 2016 review for potential upgrade to emerging markets status. WikiLeaks released 17 secret documents from the Trade In Service Agreement (TISA) negotiations on June 3. The documents have confirmed the fears of campaigners around the world that TISA is designed to benefit corporations at the expense of workers and the general public. TISA is being negotiated between the US, European Union, Australia, Canada, Chile, Hong Kong, Iceland, Israel, Japan, South Korea, Liechtenstein, New Zealand, Norway, Switzerland, Taiwan, Uruguay, Colombia, Costa Rica, Mexico, Panama, Peru, Turkey, Pakistan and Paraguay. These countries make up about two-thirds of global GDP. The secretive talks began in 2012 when a group of countries — giving themselves the Orwellian name of “Really Good Friends of Services” — became unhappy with negotiations in the World Trade Organisation, in which poorer countries were demanding more equality and a focus on development and public interest. TISA aims to liberalise services industries, including transport, telecommunications and finances. Services make up a large part of the economies of the negotiating countries, even the poorer ones — nearly 80% in the US and EU and 53% in Pakistan. This leak follows WikiLeaks' release of the TISA Financial Services Annex in June last year, and the December leak of cross-border data flows, technology transfer, and net neutrality documents. The cover page of the financial services document highlighted the extraordinary lengths that the parties would take to ensure secrecy. It said it should only be declassified “five years from entry into force of the TISA agreement or, if no agreement enters into force, five years from the close of the negotiations”. Only Switzerland has been publishing its contributions to the negotiations. This would leave the public unaware of the provisions in the agreement even as they were being implemented. International Trade Union Confederation (ITUC) general secretary Sharan Burrow said on June 5: “Trade deals being done behind closed doors are setting up working people to lose out and aiming to concentrate yet more power and wealth in the hands of multinational corporations, at the expense of the common good. One very disturbing aspect of TISA is the document uncovered by WikiLeaks revealing an entire section on immigration, referred to as “Movement of Natural Persons.” This section discusses commitments by the parties not to place undue burdens on visas and singles out face-to-face interviews as an example of “overly burdensome procedures.” [see the footnote on page 7] At a time when we face so many national security problems, why would conservatives trust this president to squelch any visa provision threatening our security? And guess who is a party to TISA? Pakistan! In addition to the massive immigration from Pakistan, we admitted 78,000 Pakistani nationals on some type of visa in 2013. Do we really want to join in an agreement that could loosen restrictions on visas from Pakistan? Guess which other country is a part of TISA? Mexico! For good measure, Turkey is also a party to TISA. What could go wrong? There is a lot of hype being thrown around about some of these treaties, but the WikiLeaks document on TISA is very believable because service industries, the tourism industry in particular – hate all restrictions on visas. Their opposition is certainly understandable, but that is the price we must pay when scrutinizing visas from volatile and dangerous parts of the world. The problem with TISA, as it’s currently being negotiated, is that under its terms, America (and any other signatory nation) would be prohibited from controlling which nation stores your personal data. 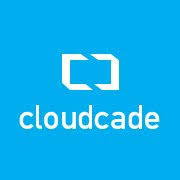 Let’s say you keep your medical records stored in the cloud with a Google application. Right now, your medical data has to be stored within the United States, with all its privacy protections. But under TISA, it won’t have to be. Google could outsource its data storage to, say, Pakistan, and you would have to rely on the government of Pakistan to protect your privacy. That ought to concern you. Your data, in other words, could be stored anywhere, and subject to any level of protection the host country believes it should have. It was only five years ago, but it feels like a different era. Roger Agnelli, the then chief executive of Vale, the Brazilian mining company, had just taken delivery of the first of an order of 35 Valemax ships, the biggest dry bulk carriers ever built. The vessels, bought primarily to ship iron ore to a voracious China, were so large that each one could carry iron ore sufficient for the steel to build the Golden Gate Bridge in San Francisco three times over. “We are living through our best days . . . I strongly believe that even better days are ahead of us,” said Mr Agnelli in 2010. But Vale’s fortunes would soon begin to fade. Mr Agnelli was ousted a year later, and China temporarily banned the ships from its ports on safety grounds. In the first quarter of this year, the company reported its worst financial performance in six years. Vale’s problems are symptomatic of a broader malaise, with emerging markets slumping in the first quarter to their weakest performance since the 2008-09 crisis. China’s appetite for metal ores and other resources is on the wane, Brazil’s once-buoyant economy is in recession, Russia is in crisis and several smaller countries are also suffering declining growth and capital outflows. The worry is that these problems are no longer contained within emerging market economies; they are spreading to the developed world too. The dependable boost that the global economy has derived from the youthful dynamism of its developing countries for well over a decade — with the exception of during the global financial crisis — has recently become an outright drag. The Bric countries (Brazil, Russia, India and China) — long seen as the world’s growth engine — are now a particular burden. Dwarfing the (Ghazi) monument today is a gleaming 62-story highrise, coming up right next door. The building is one of at least half a dozen projects springing up in the locality as developers from Dubai’s Emaar Properties PJSC to local tycoons change the face of Pakistan’s financial hub and the skylines of many smaller towns. The construction boom also marks the nation’s emergence as a frontier market after Prime Minister Nawaz Sharif averted a balance-of-payments crisis with help from the International Monetary Fund and resumed selling stakes in state companies. He is boosting infrastructure spending as the $232 billion economy expands at the fastest pace since 2008 amid the cheapest borrowing costs in 42 years. Shrugging off sectarian violence, bombings, killings and kidnappings, the benchmark KSE100 stock index has advanced about 16 percent in the past 12 months, featuring among the world’s top 10 performers. D.G. Khan Cement Co., controlled by billionaire Mian Muhammad Mansha, and Cherat Cement Co. have announced expansion plans, while steelmakers are selling shares. Amreli Steels Ltd., the nation’s biggest maker of steel bars used in construction, is planning a share sale to help double capacity. Mughal Iron & Steel Industries Ltd. completed an initial public offering in April. Pakistan’s cement industry has rallied 57 percent in the past year, more than triple the gains by the benchmark, according to data compiled by Bloomberg. D.G. Khan Cement, the third-largest maker of the construction material, has jumped 62 percent and Maple Leaf Cement Factory Ltd. has surged 161 percent and Fauji Cement Co. Ltd. has gained 81 percent. Violence, mostly from Taliban-linked insurgents who want to impose their version of Islamic law, has claimed more than 60,000 lives since 2001. Sharif survived a scare last August when opposition parties demanded his resignation over accusations he rigged the elections in 2013. He denied the allegation but agreed to a probe by a tribunal. Standing by Pakistan is the nation’s long-time strategic ally. In April, Asia’s biggest economy, China, signed deals for $28 billion of investments in Pakistan as part of a planned $45 billion economic corridor that includes power plants and dams. The development in cities and smaller towns is trickling down and is good news for smaller contractors as well . Builders in Pakistan are seeking technology from China to help cut down construction and project execution times to as little as six months from as long as five years, he said. The nation’s construction sector grew by 11.3 percent in the year through June 2014, almost double the 5.7 percent target, according to central bank data. Pakistan is a reform story like neighboring India’s, but only better, said Renaissance’s Robertson. JG Global analyst Umair Hasan said the market continued its bullish momentum as CPI for June clocked in at 3.16%. “Consequently, strong investor interest was witnessed in cements with DGKC, FCCL and MLCF all ending 1.5%, 3.2% and 2.2% higher, respectively,” said Hasan. “Leveraged scrips saw positivity through the day’s trade. Hasan added that a possible delay in implementation of GIDC translated into a positive impact amongst fertiliser scripts as ENGRO, FFBL and EFERT, with all ending higher. An analyst at Topline Securities said the Karachi bourse rallied after lower than expected CPI. Trade volumes increased to 376 million shares compared to 347 million on Tuesday. The value of shares traded during the day was Rs12.8 billion. Shares of 361 companies were traded on Wednesday. Of these, 245 companies closed higher, 99 fell and 17 remained unchanged. PACE (Pakistan) Limited was the volume leader with 26.8 million shares, gaining Rs0.43 to close at Rs7.42. It was followed by NIB Bank Limited with 21.6 million shares, gaining Rs0.18 to close at Rs2.20 and Dewan Cement with 20.4 million shares, gaining Rs0.53 to close at Rs15.05. Foreign institutional investors were net buyers of Rs182 million worth of shares during the session, according to data compiled by the National Clearing Company of Pakistan. #China’s Market Intervention & #Pakistan Lesson: Global Ponzi Denouement? For investors, the net affect of China’s actions relieved some of the pain, at least among some China-focused exchange-traded fund returns this week: The Deutsche X-trackers Harvest CSI 300 China A-Shares Fund (ASHR) is up 5% today, and up more than 1% for the week. The fund is now up more than 15% year to date. The Market Vectors China ETF (PEK) is up 7% today and up 2% for the week, bringing its year-to-date rise to more than 17%. But the iShares MSCI China ETF (MCHI) hasn’t fared as well: while up 4.6% today, the fund is down 6.5% for the week, and up 3.6% for the year. Developed and current emerging markets are not offerings returns as high as frontier markets. 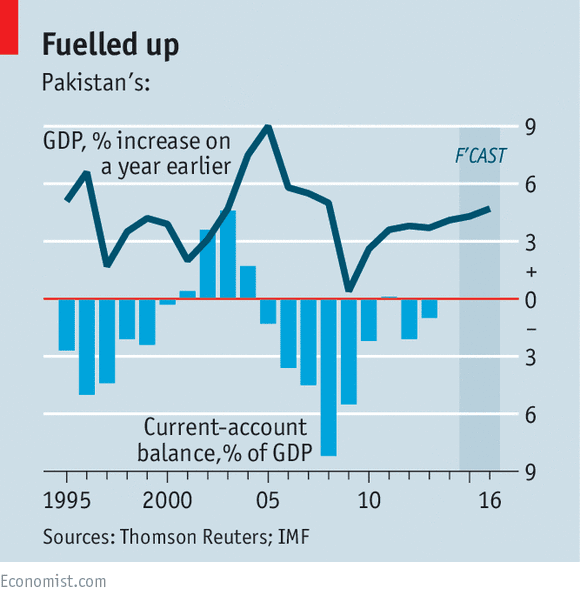 Pakistan’s economic outlook is improving, thanks to China’s investment, low oil prices and rate cuts. 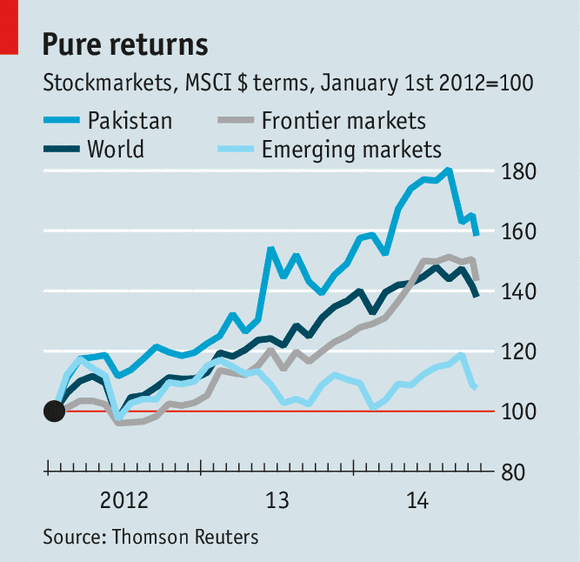 MSCI Pakistan is a decent bet for a frontier market exposure; it’s cheap on relative valuation. Developed equity markets continue to trend higher. It is hard to predict the end of the current bull market, but the returns would be limited going forward. S&P trades at a PE of 21.24 while NASDAQ composite is trading around 23 times the trailing earnings. European markets are also rising but the upside seems limited given high multiples. Emerging markets are witnessing aslowdown in growth. High return investments are not easily found in the above mentioned markets under current circumstances. However, there are alternatives for investors with a high risk-appetite: the frontier markets. Status of Pakistan might be upgraded to an emerging market. Pakistan is up for consideration to be included in emerging markets. MSCI will review for a potential upgrade in June 2016. According to WSJ, Pakistan is liquid and deep enough to be considered as an emerging market. KSE 100 index is one of the best performing equity markets since the financial crisis of 2008. Note that Pakistan meets most of MSCI's emerging market requirements. It is highly likely that Pakistan will be upgraded to the emerging market status. If that happens, the PE multiple of Pakistan's equities will expand resulting in substantial gains for investors. KSE 100 is one of the best performing equity markets trading at a discount. In 2013, KSE 100 rose 37%, in dollar terms, topping S&P 500 and every other benchmark in Europe. It was the third best performing market in 2014 with a31% return. The index is up ~19% during the trailing twelve months. Despite the run, the index trades at 8.3 times forward earnings, an 18% discount to MSCI's frontier markets. The economy is in a turnaround mode; related indicators are positive. Economy is getting a boost from several developments. Falling oil prices are a big positive that are keeping a check on inflation. This, in turn, is allowing for rate cuts, which will give a boost to economic activity and the stock market. Pakistan is a net importer of oil; prices of oil are not expected to go up any time soon, think recent U.S.-Iran deal. Oil prices will continue to have a positive impact on the economy of Pakistan. As mentioned above, low interest will also boost the economy. Interest rates are cut by 1% to drop to 7%. The Government is pursuing aggressive rate cuts; they are down from 10% in November 2014 to 7%currently. Other favorable factors include pro-business government and favorable demographics; 54% of the population of Pakistan is under 25 years. The current Government is heavily investing in infrastructure; a $500 million Metro transport project is recently completed in twin cities, Islamabad and Rawalpindi. Other construction projects are expected to boost materials and construction industry. Elimination of circular debt by the Government bodeswell for power producers. Further, consumer spending is increasing; 26% p.a. increase in spending was recorded (pdf) during 2010-2012 as compared to Asia's 7.7% growth. Analysts' expect the GDP to grow at 4.6% p.a. through 2019. Pakistan's security forces' operation against terrorism is proving to be fruitful. Number of civilian casualties has declined by 81% since 2013. Number of drone attacks by the U.S. in Pakistan has decreased 62% since 2013 indicating that terrorist element is being eliminated efficiently. KARACHI: In its maiden earnings announcement following the public listing in June, the management company of Pakistan’s first real estate investment trust (REIT) scheme said on Monday its net profit amounted to Rs169.9 million for the period ending on June 30. Trading of the units of Dolmen City REIT, which is run by Arif Habib Dolmen REIT Management, began on the Karachi Stock Exchange on June 26, although the announced profit is for the period starting on January 20 and ending on June 30. REITs are collective investment schemes that pool investors’ funds for onward investment in real estate. No year-on-year comparison of Dolmen City REIT can be made because of the unavailability of comparable data. Traditionally, small investors have been unable to take part in real estate investments in Pakistan, as the property market is considered highly illiquid and capital intensive. There are few publicly listed property developers in Pakistan while REITs had practically been non-existent so far. However, as the first-of-its-kind investment avenue in Pakistan, Dolmen City REIT offers small investors the opportunity to take advantage of a booming real estate market by trading in REIT units. Besides being the first REIT in Pakistan, Dolmen City REIT is also the first publicly listed trust of its kind in South Asia. REITs operate like close-end funds, as pooled capital is invested in real estate and its units are listed on the stock exchange that investors can buy and sell every day just like ordinary stocks. The underlying assets of Dolmen City REIT are the two components of the Dolmen City project: Dolmen Mall Clifton and the Harbor Front building, which are located on the Karachi seafront. The property was originally owned by International Complex Project (ICP). The Arif Habib Group controlled 20% shares in ICP while 80% ownership rested with the Dolmen Group before the public listing. The monetary value of the total fund of Dolmen City REIT is Rs22.2 billion. The property generates rental income that is distributed by the REIT scheme among unit holders in the shape of dividends. The first profit announcement was accompanied with a final cash dividend of Rs0.08 per unit for the period ended June 30. Speaking to The Express Tribune, Arif Habib Dolmen REIT Management CEO Muhammad Ejaz said the trust was registered on January 20, but the rental income started accruing to Dolmen City REIT from June 1. Therefore, the rental income of Rs193.6 million, which resulted in the net profit of Rs169.9 million, was generated in the month of June alone, Ejaz said. In a pre-IPO interview, Ejaz had said unit subscribers should expect a 9.25% dividend yield in the first year of operation.